Using video from the Shorezone coastal inventory to produce an initial estimate of the volume of log debris within the operating area of the Western Log Sort and Salvage Co-operative. The Western Log Sort and Salvage Co-operative exists to improve the economics of marine log salvage (a.k.a. beach combing) and reduce the amount of drift timber on the BC coast. Rootless, branchless free floating timber can disrupt nearshore and riverine ecosystems and represents a significant navigation hazard. The actual volume of beached timber lining BC’s coasts is not well known. 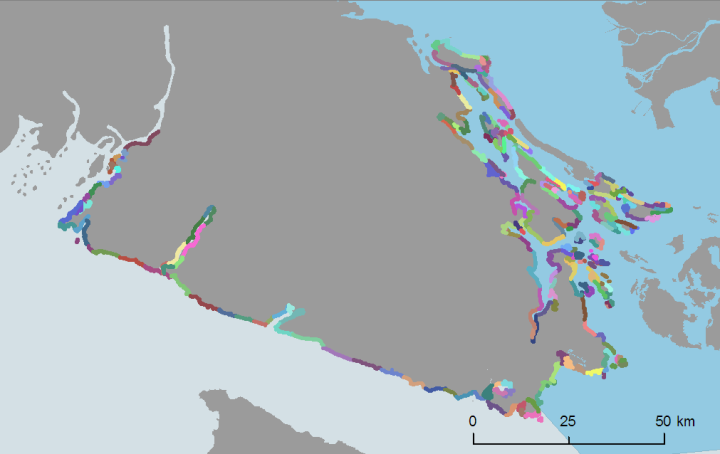 The BC Biophysical Shore-Zone Mapping System is an inventory of all biological and physical elements of BC’s coastline. The inventory was carried out principally through video-recorded overflights of the coast. For a portion of the BC coastline the raw video from those overflights has been posted online (here’s an example). Geocology used the GIS and video elements of the Shore-Zone inventory to conduct a rapid assessment of beached large woody debris volume for a portion of the operating area of the WLSSC. Over 200km of coastline were viewed and counted. The approach provided a degree of error checking through repeated observation of a subset of available segments, but was focused on producing an order-of-magnitude estimate of log volume using minimal time and the video resources available. Statistical analysis was used to produce low and high range estimates for the viewed area and extrapolated to larger portions of the coast.